Last week at Global Math Department, we learned from Max Ray (@maxmathforum) about using Noticing & Wondering. As with all the best Global Math presentations, I heard from folks who used the technique the very next day. I always seem to run a little slow compared to my Tweeps, so it took me a few days to find a good entry into my physics classes. Give them 1 minute to write individually, 1-2 min to discuss in small groups, then 3 minutes to share the best noticings.Here’s a picture of my 1st period class’s list. Ask the class to think in physics terms, “What do you wonder?” Again with the write-discuss-share thing. Here’s my 1st period class’s list. I asked them which they wanted to pursue, height of the cliff or acceleration due to gravity. They liked gravity. After we estimated cliff height (which involved the search: “how tall is Wiley E Coyote?”) and the dust settled, we found g was about 3.2 m/s2. Holy cow, this N+W is the good stuff. Kids were engaged, the framework kept us on task, we found a great physics problem I’d never considered, and I had an excellent entry into projectile motion. 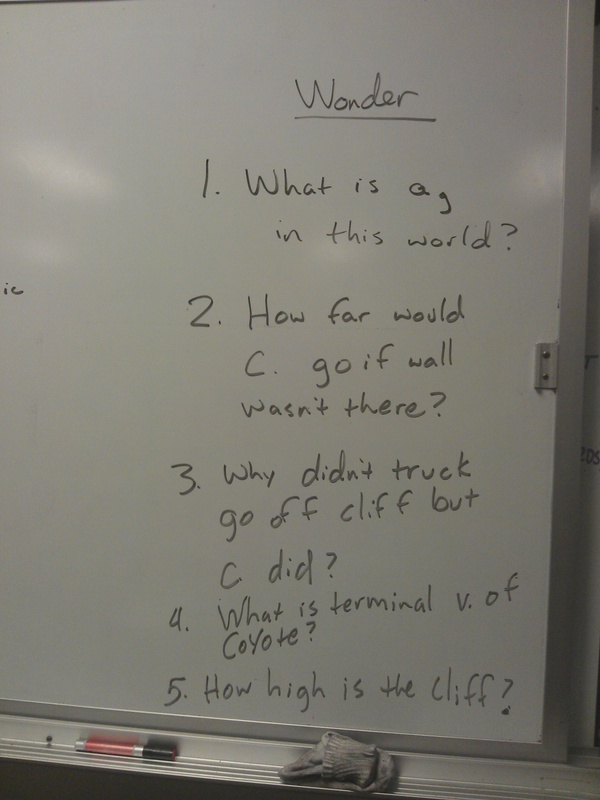 Well done, 1st period physics, and thanks for giving me something to wonder about! 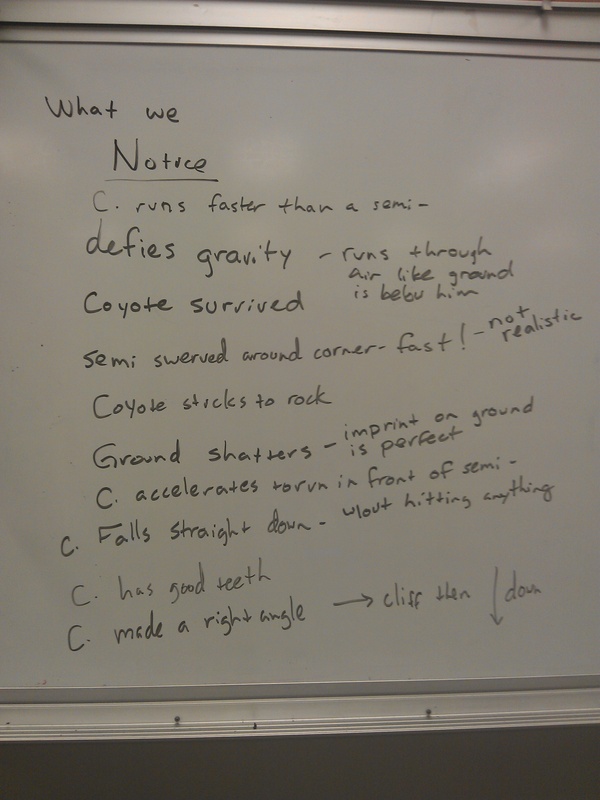 PS — I recently learned that coyotes can reach top speeds of 40mph, while road runners top speeds are about 20mph. Very fun clip. I have gone full blown Notice and WOnder with my students this year and I doubt I’ll ever look back. “Kids were engaged, the framework kept us on task, we found a great physics problem I’d never considered, and I had an excellent entry into projectile motion.” It’s a wonderful thing. Sounds cool. Roadrunner May have to make an appearance in my mechanics lessons!